I got 99 problems, but my computer ain’t one! hello all my fb friends…I want to share with you an amazing experience I just had. 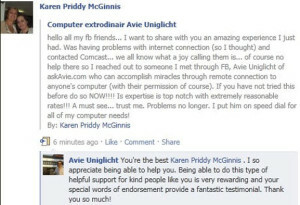 Was having problems with internet connection (so I thought) and contacted Comcast… we all know what a joy calling them is… of course no help there so I reached out to someone I met through FB, Avie Uniglicht of aSKaVIE.com who can accomplish miracles through remote connection to anyone’s computer (with their permission of course). If you have not tried this before do so NOW!!!! His expertise is top notch with extremely reasonable rates!!! A must See…trust me. Problems no longer. I put him on speed dial for all of my computer needs! 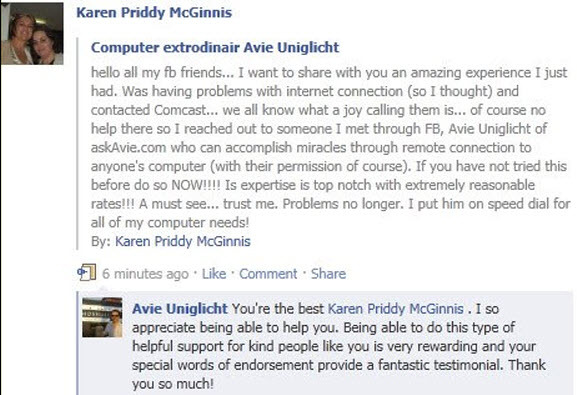 Thanks Avie, your knowledge of computers and professionalism is amazing! I will highly recommend you! This is one of the happiest days of my life. I know it’s a little dramatic but I wanted to thank you Avie for how quickly you were able to fix the 2 issues I had with my computer. How to make a business woman happy? Get her computer working at top speed which you have done. 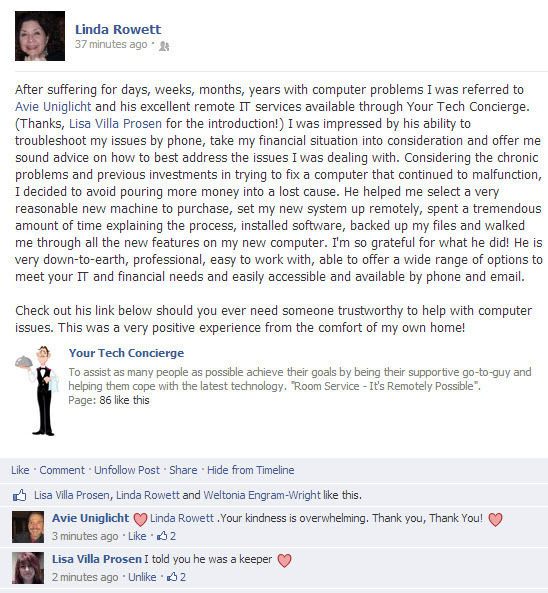 I am so glad that I have you in my hip pocket as my tech concierge because your services are invaluable. Avie, thank you so much for all your time, patience and expertise. I’m so grateful to be back up and running on my new set-up with your help! 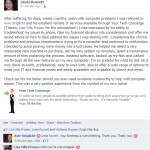 I shared your link and posted on my page and am happy to recommend your services to anyone who asks. Looking forward to working with you in the future. Thanks again! 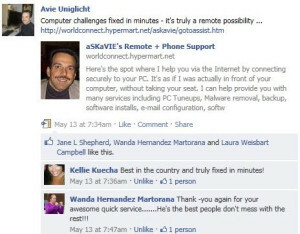 After suffering for days, weeks, months, years with computer problems I was referred to Avie Uniglicht and his excellent remote IT services available through Your Tech Concierge. I was impressed by his ability to troubleshoot my issues by phone, take my financial situation into consideration and offer me sound advice on how to best address the issues I was dealing with. Considering the chronic problems and previous investments in trying to fix a computer that continued to malfunction, I decided to avoid pouring more money into a lost cause. He helped me select a very reasonable new machine to purchase, set my new system up remotely, spent a tremendous amount of time explaining the process, installed software, backd up my files and walked me through all the new features on my new computer. I’m so grateful for what he did! He is very down-to-earth, professional, easy to work with, able to offer a wide range of options to meet your IT and financial needs and easily accessible and available by phone and email. Check out his link below should you ever need someone trustworthy to help with computer issues. This was a very positive experience from the comfort of my own home! Couldn’t be more grateful for your skills and attentiveness. Way to save the day. No I mean the week. No I mean the month. No I mean us. Five star service!!! !